In the October 16, 2012, Wall Street Journal there was an article titled Big Explosions, Small Reasons. The article reports recent research on “Why Social Rule Breakers Spark Angry Outbursts.” I have written previously on this site about how secular research in the behavioral sciences can contribute significantly to our understanding of one another if we remember that any findings must be set within a context that accounts for God. Our Creator made a universe filled with creatures of both complexity and order. Because of that amazing order secular researchers can make faithful observations; what they typically don’t do is set such observations in the larger perspective that recognizes God’s sovereignty and creative orderliness: the bigger picture. “But you are a chosen people, a royal priesthood, a holy nation, a people belonging to God, that you may declare the praises of him who called you out of darkness into his wonderful light. Once you were not a people, but now you are the people of God; once you had not received mercy, but now you have received mercy. Picture a scenario that is likely to trigger your anger, and imagine a calm response. Think about the consequences of your anger. Anger can make you feel bad. Ask your spouse or significant other to help you calm down in the heat of the moment. Create a password—a hand on your arm, a funny look—that will diffuse your tension, not escalate it. Empathize. Remember a time when you inconvenienced someone. What’s wrong with being nice? Talk yourself down in the heat of the moment. Tell yourself a coping statement, like “It’s not the end of the world.” It’s important to decatastrophize the incident. Don’t react to rude or inconsiderate behavior. If someone cuts in front of you at the grocery it’s not about you. “For even Christ did not please himself but, as it is written: “The insults of those who insult you have fallen on me.” For everything that was written in the past was written to teach us, so that through endurance and the encouragement of the Scriptures we might have hope. 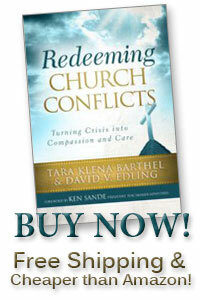 Dave Edling is an experienced Christian conciliator who has worked with many conflicted churches. During his decade of service on the senior staff of Peacemaker Ministries, he participated in over 200 mediation and arbitration cases and worked with nearly twenty thousand Christians engaged in conflicts affecting churches of almost every denomination. Dave holds several graduate degrees in addition to his Bachelor of Science degree from Oregon State University. They are: Master of Arts in Human Behavior, United States International University (now Alliant International University); Juris Doctor, California Western School of Law; Master of Arts in Religion, Westminster Seminary California; and Master of Arts in Biblical Conflict Resolution, Birmingham Theological Seminary. Dave has served as a trustee on the Board of Directors for Covenant College and Westminster Seminary California and has taught in the Doctor of Ministry programs for Reformed Theological Seminary, Mid-Western Baptist Theological Seminary, and Westminster Theological Seminary. In addition, Dave has been a lecturer in practical theology for several other Christian colleges and seminaries. This entry was posted in Biblical peacemaking in the church. Bookmark the permalink. 1 Response to What Rules Govern Your Interactions with Others (Especially in Your Church Conflict)? Some social scientist observations on the origin of quarrels.